The Bombay Master Printers’ Association (BMPA) will be organizing 13th edition of Print Summit on 24th January 2019 in Mumbai. In all, there will be as many as 19 speakers from diverse sectors. 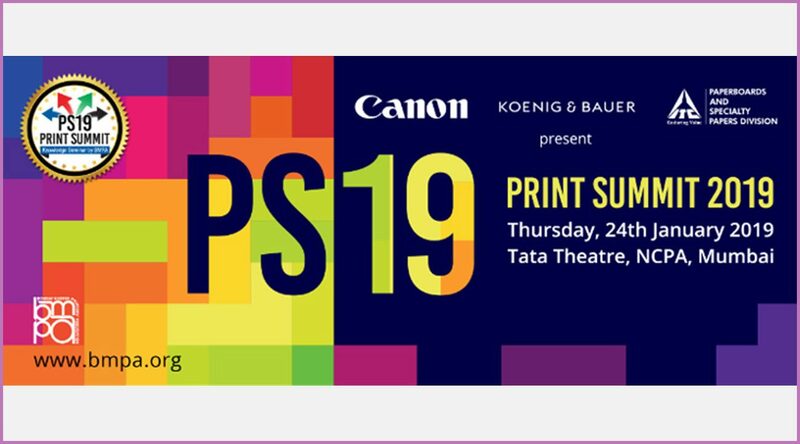 Participants from commercial printing, package printing, labels, POP-POS, wide format printing, on-demand printing, corrugation, creative industry and ad agency are expected to participate in the day long Summit to be held at Tata Theatre (NCPA) in Mumbai. Personalities attending the conference are largely owners, decision makers, technologists, shop floor personnel, designers IT & admin folks and students. The Bombay Master Printers Association is a well networked association of print providers, pre-press, pre-media specialists, post-press and converting, package printing, agencies; And printers’ suppliers i.e. manufacturers and traders. To commemorate its 50th Anniversary, in 2005 BMPA initiated and organized the first Print Summit.